Roy created this sketchbook as a boy living in the area of RAF Mendlesham Air Force Base during WWII. He has protected it through the years, but not many people outside of Mendlesham have seen it. I was very fortunate to have the honor of working with him to scan and publish his sketchbook electronicly so others can see it as well. I met Roy on my first visit to Mendlesham through a acquantainces I made researching my father's WWII pictures. I got to meet him again on my second trip to Mendlesham for the dedication of the new Mendlesham War Memorial in November 2015. On that trip I brought all my scanning gear, and we spend an entire afternoon scanning the sketchbook page by page at his home in Mendlesham. Here is a short video segment by Sarah Lucy Brown where Roy provides some background on his sketches. 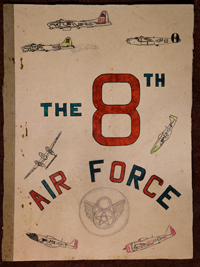 "The 8th Airforce" by Roy Colchester is licensed under a Creative Commons Attribution 4.0 International License.